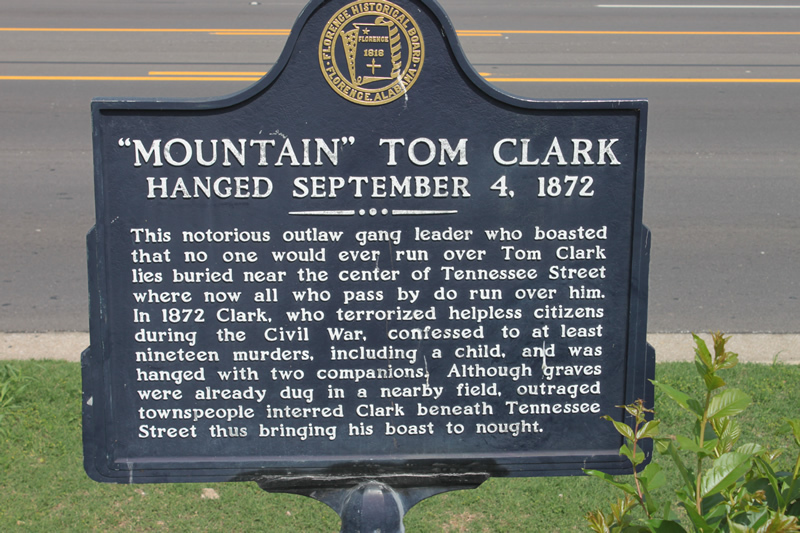 Mountain Tom Clark was a notorious outlaw gang leader who terrorized helpless citizens after the Civil War. He confessed to at least nineteen murders. 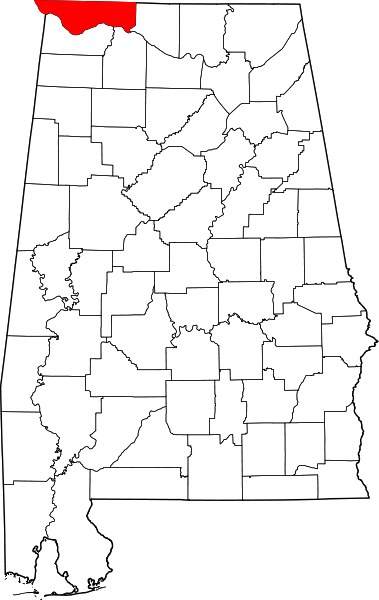 The people of northwest Alabama called the gang the Bugger Gang. As a preface to my story, I will say to The Reaper’s readers that everything that will not bear the closest investigation has been ignored, because, even of the man who is steeped in crime, the truth is what history demands. Stories of excesses have been searched thoroughly and traced to their origin, and where they were entitled to credence, they are here related. 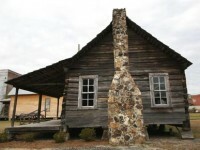 Tom Clark first made his appearance in Lauderdale county, Ala., in 1862 or 3. He went from one of the mountain counties, but whether he was a native of the State or not is not positively known. 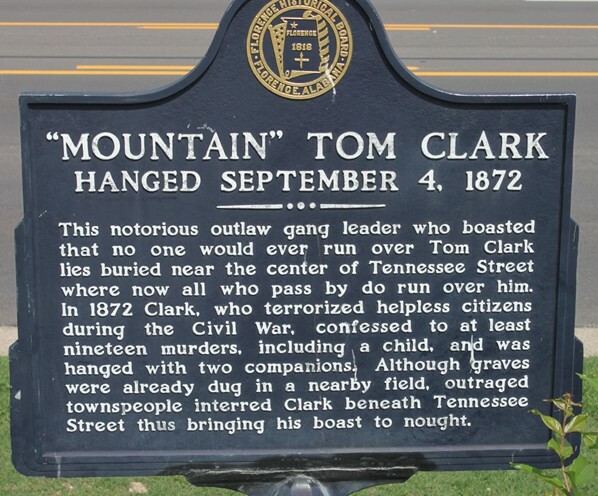 He located in the Blackburn settlement, and was known as “Mountain Tom Clark,” for in the near neighbor hood lived another man also named Tom Clark, who was styled “Chinubee Tom Clark.” It is of “Mountain Tom” I write. was caused by the rigid enforcement of the conscript law. He was run from his mountain home by the officers and sought a retreat in Lauderdale county, but there they fell onto him again. On a cold and disagreeable day, while building a stick chimney to his uncompleted house, in which his wife and babe of a few days of age were ill, the power of the conscript act fell upon him. He was taken on the way to the Confederate army, but he made his escape, and in his unlettered mind the passions of a thousand devils were aroused. He became a demon. Being a mountaineer, he was an unerring shot with a rifle, and the suspicion that a man was a conscript officer sealed his doom. The Confederate officers getting “too anxious for his services” he concluded to enlist in the United States service. 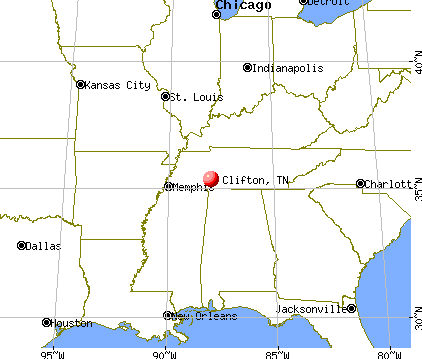 He went to Clifton, Tenn., and there enlisted in the Federal army. Here would have ended all his trouble had he so conducted himself as to have gained the esteem and confidence of his superiors and comrades. But his avarice here forfeited his life by all military laws, and to save that miserable and blackened life he again forfeited it by desertion. After enlisting and being mustered into the army he was detailed as a guard, and, at that time, orders were strict and discipline rigid. Everything was in confusion, and scouting was the order of the day, guerillas (sic) and bushwhackers were running amuck. Orders at the post were to let all persons enter, but let no one under any circumstance pass outside the guard line. Here Clark made the mistake of his life. A man past the meridian of life, wanted to go outside the lines, and being the average in intellect, was not long in discovering the weakness of Clark. So the gentleman informed him if he would only let him pass out of the lines no one would be the wiser, besides offering him at the same time a gold watch. The rich color aroused his greed for lucre, and soon the watch was in Clark’s pocket and the stranger going his way. His absence was soon noticed and an investigation instituted. Clark had enough foresight to see that his duplicity would be discovered, and he be shot at the stake by sentence of a martial court, and to escape such a fate, he deserted. Soon after his infamous acts as a soldier, he, in company with one of the worst gangs of cutthroats that ever cursed the face of the earth commenced a reign of terror. Men reared in the county, some of them in the town of Florence, who had served in the Confederate army, became deserters and had enlisted in the Federal army only to desert as soon as they could well do so with the accoutrements (sic) furnished, to engage in a series of the most bloody and brutal murders and robberies that ever blackened the pages of American history. 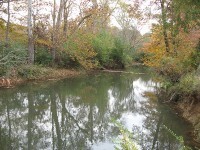 At Bainbridge, on the Tennessee river, his gang killed three Confederate soldiers. He went to Bainbridge for the purpose of killing Silas Green, who had been wounded in a fight with Clark some time previous, but he had escaped to the south side of the river. 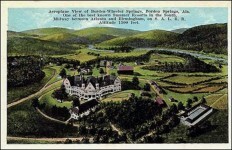 The soldiers were on the bank of the river and were waiting for an opportunity to cross to the opposite shore; one of them had gone to the cabin occupied by Mrs. Green and children to get fire from which to kindle their campfire, when the villains rode up and without warning shot two of them to death, then riding up to the cabin met the third man at the very threshold, shot him while pleading for his life, and after he fell a member of the gang seeing he was not dead remarked, “_____ you aint you dead yet?” shot him again in the breast, holding his pistol so close that it set fire to the dead man’s shirt. After these heartless murders one of them took fire from the hearth and set fire to the cabin, and Clark put it out and told the scoundrels to leave. While he has been accredited personally with these murders, they were committed by other hands that paid the penalty seven years before Clark expiated his crimes. they tortured several citizens. That reliable and christian citizen, Dr. Joseph Milner, and that good old market gardener, John Kackelman, were maltreated and tortured: Edmund Poole, col., was also tortured and robbed, together with many outrages that would make the imps of perdition stand in amazement at their brutality. During Clarks’ career as a guerilla, (sic) he murdered a man named Howell, shooting the old many while sitting on a fence, and then putting his gun through the fence shot Howell again as he lay on his back. Soon after the Wilson murder two members of this gang of vilains (sic) were shot to death by federal aurthority (sic) for the many crimes committed by them, out a little way from town on the Military road, in a little ravine, and amid their ribald and blasphemous remarks the fatal volley was fired and their souls were ushered into the presence of an offended God. Seven years and a half after the military execution of Campbell and Oliver, Clark was hanged by a midnight mob. He was arrested in Jackson county, Ala., and carried to Florence and incarerated (sic) in jail. 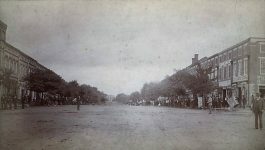 In October, 1872, a mob of citizens forced the jail doors open and took Clark, together with two burglars, to the lot on which now stands the Masonic hall and hung all three to an elm tree. As the two men died seven years previous blaspheming, Clark went before his offended Maker pleading, for that mercy and forgiveness he never showed or granted his helpless victims. 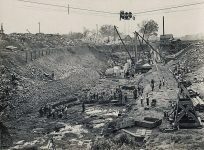 At first, Tom Clark and the other two outlaws lynched with him were buried in a field across from the cemetery, but one of the men in the mob recalled Tom boast that “No man will ever run over Tom Clark!” so his body was later dug up and buried under Tennessee Street outside the gates of the Florence Cemetery. It is still there today. He said,”No one would ever run over him.” Now they do it daily!!!!! Thank you for these post. Love learning Alabama history I never would have known otherwise. http://vulcan.bham.lib.al.us/search/o4008390 Apparently the book about all this is out of print and hard to find. I found a version on amazon for $100. I too married a Chisholm. My wife is from Raleigh, MS-there is a big nest of ’em in Smith County, MS.
My congratulations on your having a Chisholm on your arm. He is not buried under the street, but rather an unmarked grave elsewhere. Makes a good folklore tale. Were you there when they buried him? My grandmother used to talk about “Uncle Tom Clark.” Yep. The same guy. I think the local genealogical society has the book back in print. Please, those of you who know, “what is the origin of the name of “The Bugger Gang? Many claim this is not true. I submit figure out where the road into the cemetery was through the farm field that is now TN street and you have found the approximate location. 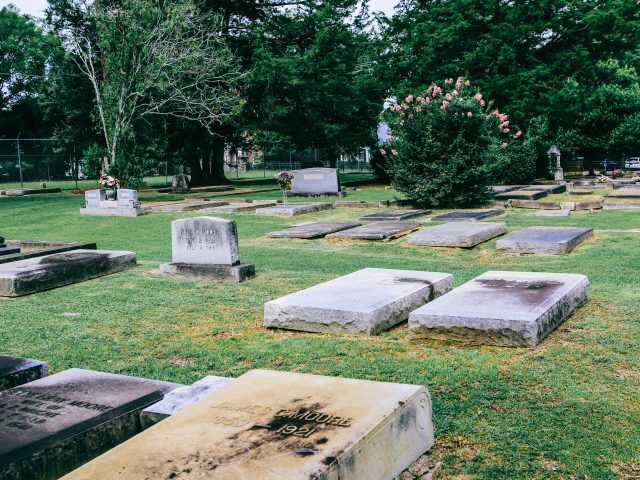 The ladies of Florence asked the three lynching victims not be buried in the Florence cemetery. Amanda Daniel Ridge, this is near Florence cemetery. I have heard a little about this story before. I didn’t know if it was truth or myth. 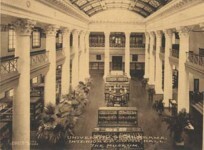 Local historians agree that he is most likely not buried under Tennessee Street, but his burial location is not known. His gang did torture and murder some of my ancestors though.